Review: Although the lush visuals are what served as my entry point into the rustic Tokyo countryside depicted in Studio Ghibli’s the Secret World of Arrietty, it’s the music that really allowed me to completely immerse myself into Arrietty’s realm of magical realism. Cecile Corbel’s Celtic-influenced compositions and her performance as vocalist are captivating; her harp melodies, with their soothing, mellow aura, beckon me deeper into the emotional sphere of Arrietty’s narrative and her vocals glide effortlessly across to match the content of the piece in question. Together, these elements washed over me with their waves of nostalgia, melancholia, and hope. After watching the movie, it’s hard to imagine Arrietty’s soundtrack taking any other form; it was extremely effective in conveying every single aspect of the movie. Nothing captures the nostalgic facets of Arrietty’s setting quite like the opening track, “The Neglected Garden.” Corbel’s gentle vocals are incredible and grabbed my attention from the get-go as they evoked the quietude of the titular setting. As the song progresses, the vocal part takes on an inviting tone as the piece becomes infused with more energy until it blossoms forth radiantly through the addition of the pipes and violin to draw you into this memory. To call that melodic blossoming beautiful is an understatement; the vivid pastoral setting comes to life, and the air of joy that it brings is irresistible as it inspires me to recall and savor those wonderful memories of my childhood. And just when I thought the soundtrack couldn’t top such an opener, “Our House Below” comes in with its soothing sound, rich in warmth and contentment. The harp introduction ripples serenely, making way for a song that fittingly ends the day with an idyllic (and idealistic) depiction of a cozy evening. Here, Corbel’s delivery instills a quaint sense of charm and while listening to her, I cannot help but relax as the warm vocals envelope me with a comfort borne from the loving familial bonds that the song conjures forth. Between this and “The Neglected Garden,” the quiet feelings linger on, and the power of the vocals and instrumentals are sufficient to evoke those nostalgic memories. 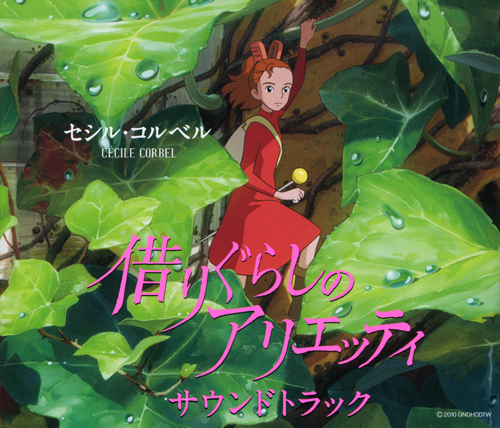 Though much of Arrietty’s soundtrack tends toward pieces that tug at those sentiments, Corbel does supply an array of other styles that fit the imagery of the film nicely. “Spiller” is an accurate depiction of the piece’s namesake character with its use of Celtic instrumentation layered atop a drumbeat that carries a tribal rhythm and energy. The melody has a jumping, unrefined quality to it, but it fits well given Spiller’s untamed appearance and vitality. “The Wild Waltz” is also energetic as it relies upon the plucked strings along with a quickening tempo to inject a sense of urgency into the scene. Finally, the album’s tense moments arise in “An Uneasy Feeling” where the dissonance along with the percussion’s pitter-patter gave me a sense that there was malice afoot. As the story wades into deeper emotional waters, Corbel’s music rises to the occasion. “Sho’s Lament” is quiet, but packed with a sorrow depicting the titular character’s initial sense of loneliness and helplessness. Unlike a lot of other despondent tracks I’ve listened to over the years, this one lacks a strong sense of anger or anguish, making the feelings it imparts all the more tragic as the melody bears the weight of resignation to indicate that the character has completely given up on life. “Rain” takes on a similarly mournful tack, as it draws upon the theme used in “Arrietty’s Song” to emphasize the melancholy grayness of the title event rather than to depict a cleansing, rejuvenating downpour. Apt, given that Arrietty’s family’s future is uncertain, and the piece conveys that forlornness wonderfully. Nevertheless, things do look up, and as the soundtrack nears its end, the music becomes more heartfelt with dreamy tracks mixed in with fond farewells. The former materializes somewhat in “Arrietty’s Song,” where Corbel’s vocals and the instrumentals bring a yearning, longing sentiment to the fore. That said, “Arrietty’s Song” is restrained in its execution; the instrumentals drip more heavily of regret than of hope and the lyrics waffle between the desire to stay behind and the desire to explore the world beyond the comforts of home. However, that restraint works well in this instance as Corbel’s voice is more than capable of conveying the multifaceted nature of this piece, switching between a forlorn inflection and a more hopeful tone when the song calls for it. And, of course, “Goodbye My Friend” delivers with the farewells. Though this song speaks of partings, the feeling it conveys is a hopeful one as the warmth Corbel emanates calms and assures the listener that the bonds that tie Arrietty’s characters will forever last, and that this ending is but a new beginning. With these feelings in tow, I found myself buoyed along by the optimism that this song offers. But the feelings that remain are exquisite and for Cecile Corbel, her anime music debut yields a wonderful soundtrack. In watching Arrietty, it’s nearly impossible to divorce Corbel’s compositions from the movie’s content. That’s no faint praise, for Corbel’s work here is one that can sit proudly on the same shelf as those of Ghibli veterans Joe Hisaishi and Yuuji Nomi. I absolutely loved the music in Arrietty. It’s gorgeous and was a perfect fit with the European origins of the story. I’ll definitely be looking for this soundtrack. Despite having listened to the music on several occasions, nothing quite prepared me for their use in the movie and I was very amazed by how seamlessly everything meshed together. Definitely something I won’t be forgetting any time soon, especially when you factor in Corbel’s vocals which are absolutely divine. I saw the movie when it opened last Thursday in Australia with the Japanese audio and English subtitles and really enjoyed it including the soundtrack. Does anyone know if the English dub versions of the movie use the same musical soundtrack? I just saw the movie in the USA yesterday. It is the same music and songs that are posted on this website. Such beautiful music! I am surprised they did not go with Joe Hisaishi, but this new music blew me away. I am, however, incredibly disappointed that itunes is not selling this album. Does anyone know where I can purchase the soundtrack cd for this movie? Well, if you look up top on the table, you can see places that sell the album online. I don’t know if any US-based company will pick it up, but it’s worth importing if you ask me! Thanks for the update! I’ve added a link to iTunes to reflect your information! Really enjoyed the music for Arrietty; it fit in very well to Ghibli’s story and animation. @Arthur Usually they do not change the soundtrack… That’s probably even unheard of. Kiki’s Delivery Service had the OP and ED changed, and the Japanese version of Whisper of The Heart had a different OP to the English dub version. I may see the English dub at the cinema, otherwise I’ll wait for the blu-ray release. Yeah, we’ll pretty much have to see how Disney handles the dub. I recall that Ponyo’s ending song was also different from the Japanese release since they subbed out the Japanese lyrics and replaced them with English ones. I know that the french version of Arrietty had a different version of Arrietty’s song (in French ^^ ). Maybe because of Corbel nationality ? Oh, of course; OPs/EDs certainly are subject to change when localizing. You were asking about the soundtrack before, so I presumed that you meant precisely the soundtrack, not the OP/ED. They can’t just plop in an entirely new score, and it’s expensive to do so, etc. etc. Nice! I wonder how difficult it was to rework the lyrics to match the French version. I certainly do like the little changes they made to the way the lyrics were sung. just caught the film and the music was spot on. Main theme fit the whole thing perfectly, and really enjoyed the whole feel of it! It’s definitely very different from the other Ghiblis that’s for sure. Less epic, very much more playful! Please forgive me that I just drop now..I just found this blog right now, and how happy I am to read your great review. Especially in Corbel, i can’t believe her at firs (pardon me, but my ears are used to heard Hisaishi’s work), but wow..wow.. I love the soundtrack for everybits!